Despite our advancing knowledge of macular degeneration, a disease that affects the retina causing irreversible loss of vision, there is no cure. This retinal disease is often called age related macular degeneration (AMD) because it becomes much more common with age. Around 30% of people in the UK who are over 75 have it to some degree and around 7% of them are severely visually impaired as a result. That means that by 2011, there could be close to 240 000 people with vision problems due to AMD. Treatments aim to protect the retina from further damage by blood vessels growing through the delicate tissues as the eye tries to compensate from poor blood flow – anti-angiogenesis inhibitors can slow the progress of the disease but do little to improve vision. Recently, new hope that a medical device can be used to allow better vision in people with age related macular degeneration was raised when a new telescopic eye implant was developed in Italy three years ago. It has already been used on some patients in the UK and was approved for use in the USA by the Food and Drug Administration (FDA) in July. What is a Telescopic Eye Implant? As its name suggests, it’s a tiny telescope that is actually implanted into the pupil of the eye. There are three types available at the moment. The IOL-VIP system has two intraocular lenses that sit inside the eye, one behind the iris and one in front. This gives the recipient a magnified view of the world that is 130% times normal. The Implantable Miniature Telescope is a tiny cylinder of glass that contains several lenses that are embedded in another lens, which all fits into the eye behind the iris. This allows a slightly greater magnification of 220%. Finally, the Lipshitz Macular Implant is placed inside the natural membrane in which the eye’s lens sits; it contains several mirrors that reflect incoming light and produce a magnification effect of 240%. Although the different types of telescopic eye implant work in different ways, all aim to magnify the image seen in the centre of the field of vision. In people with macular degeneration, this central point of vision is often very badly affected; while they may still have quite good peripheral vision, they cannot focus to see the fine detail of any single object. As well as magnifying the image, so that what visual information is available is maximised, telescopic eye implants also direct the image to areas of the retina just outside the macula, where the photoreceptor layer is still quite intact. This avoids the damaged area of the macula itself and allows a much clearer image to be processed by the brain and makes telescopic eye implants the only treatment available to restore central vision. How is the Telescopic Implant Fitted? The operation is technically intricate but does not require a general anaesthetic. 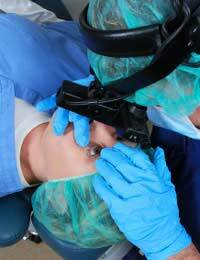 Like a cataract operation, it can be done with a local anaesthetic. It takes longer than cataract surgery – about 45 minutes – but is usually done as a day case, with the patient being allowed home later that same day. The eye’s own lens is removed after it has been softened using an ultrasound technique. The telescopic implant is placed into position, where the natural lens was and is fixed into place using very fine stitches, which need to be removed about 3 months later. Complications are very similar to those of a cataract operation. At the moment, the implantation of a tiny eye telescope is available mainly for the over 75s who have age related macular degeneration (either the wet form or the dry form) or who have other eye conditions that affect the macula. These include myopic macular degeneration, inherited conditions such as Stargardt’s dystrophy and Best’s dystrophy, or who have holes in the macula. It is not suitable for everyone but people who have been given a telescopic eye implant are very impressed with the results. Regarding the implants, I have enquired at a clinic and was told not suitable for wet AMD Regarding a previous question, I know its only available privately, at around £3000 per eye.